On this holiday greeting card, the serene Lincoln Memorial is decked out in colors that conjure up visions of persimmons, pinecones, and pine boughs that you might gather up to decorate for the holidays. Inside, a cheerful greeting of "Happy Holidays" appears in Liz's handwriting. You also have the option of choosing one of nine other festive greetings (pdf 329k). The back of the card features the following quote from Abraham Licoln in type: "The better part of one's life consists of his friendships." 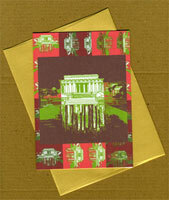 The 4 1/2" x 6 1/4" card is printed on bright white recycled card stock and paired with a slightly shimmery gold envelope. Looks very luxe with the card. Sets of 8 cards are packaged in kraft box with clear lid.